Dropped of the rear rim, tire and tube at a shop today for the 900. We'll see if they can figure out the "Wheel Locks." for the tire. 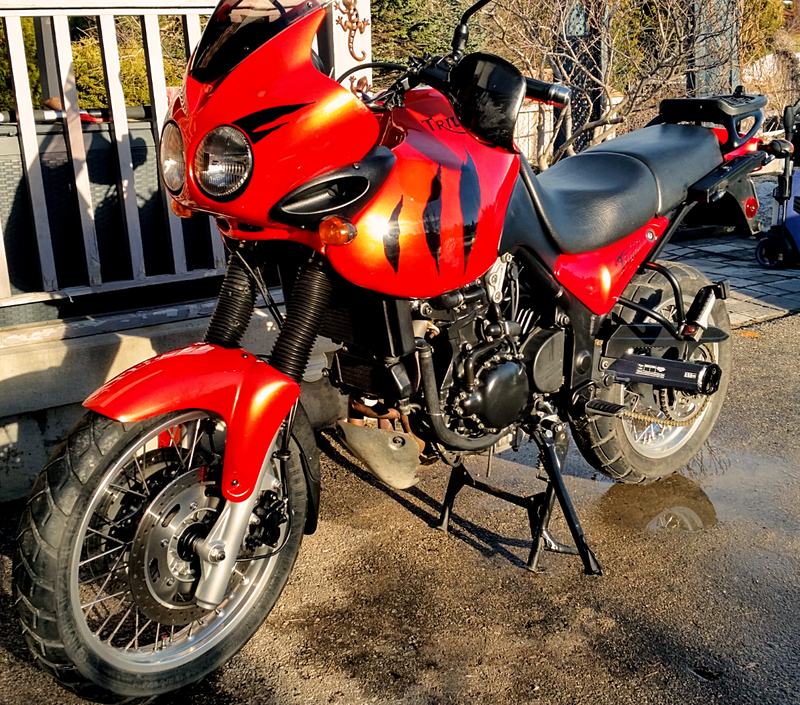 Bought a 2006 Suzuki DR 650 last month. The prev owner had put after-mkt high flow header, mid pipe, and a muffler from an early model GSXR 1000 on the bike which leaked air from every connection. Turns out he had used only one of the three required gaskets. I replaced the header pipe with a FMF powerbomb and put it all back with the proper gaskets and new spring tensioners. With the leaks eliminated the noise level is drastically reduced as well as the decel popping. Once I get the power mods worked out I'm going to address the mushy suspension but that's going to require some big bucks. Overall I love this bike. I haven't ridden off road since college days so that will be a major learning curve but I'm taking it easy and hope to find a nearby MSF Dirt School course nearby this spring. I washed my Versys650 again. Third time now. It got a bit dirty from the flogging I gave it last week in TN, NC, GA. About 2000 miles between to/from and hammering on excellent not crowded roads. Even hit the Dragon on Thurs and met not one single car or bike the whole route from TN until the Dragon Store. Awesome. Drive chains have definitely come a long way. I rode 550 miles up at just under 80, about 900 miles hammering it in the mountains, and 550 back into the wind at 80-90 mph. I only had to adjust the chain one flat on the adjuster bolt. D.I.D. X-ring chain with fresh sprockets and Chameleon Plus oiler. After this trip, I really, really like this bike. Stable in the wind on the freeway, excellent manners on the fun roads,a fun engine that is alive and really fun, smooth and quiet at 5-9k rpm. Just enough exhaust noise when getting on it to float my boat. And it's purty. I wonder if there is a Shoodaben Engineering flash in it's future. Re: What have you done to your Triumph Tiger today? Fork oil! It was suggested going to a heavier oil (from 10 to 15), because I'm huge (6'3" 240). deer whistles....those things really work???? Deer Beware! The shop figured out the wheel locks and the 900 is sporting a new rear tire. Pulled the carb rack, put in a float needle and seat in #3. Set the float with the clear tube test and reinstalled the carb rack. Fresh gas in an empty tank and she fired right off. No leaks out of the over flow tubes. Yeah!!!. Went for a cold and short ride today. Runs good. The rear tire is smooth and I like it. I had never run an IRC before. Profile is better than the typical old school Dunlap. Next is a carb sync with the Morgan Carb Tune and readjust the air screws. Traxxion says my rear Penske shock must have come off a wrecked bike. So, a simple revalve and spring now also gets a new shaft. Up front, I thought I blew the seals. No - someone did that long ago. Seriously glad I dropped Sue off. The spa treatment should set me straight. I took my wr250r out for a short cruz for bbq. The thing don't need much maint at all...a lazy man's dream! Ordered up a new rear tire for the Versys, wore out the one I put on a few months ago. Getting it prepped for a run out to Bic Bend, then Cliff's, then the Conclave. Then it'll need two more tires. Finished up most of the winter project. I am now learning and playing with all of the Power Commander stuff. Man, It's like going back to school. 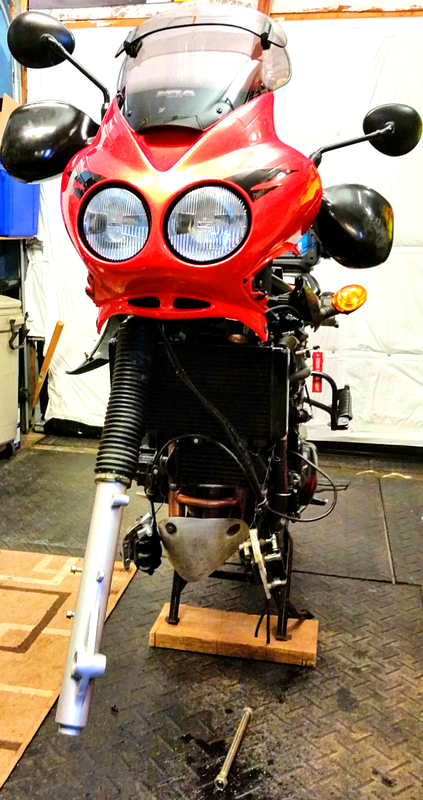 At least You can quickly get to a point where the bike runs good and then start fine tuning. I am also putting all the stuff I fabricated through a thorough torture test. I want to make sure nothing cracks, bends, breaks, etc.. before I powder coat it all. Out of all of it, the Co2 air shifter has to be the favorite mod. Being able to just push the horn button when you want another gear is just too much fun. All I have to do is reach down a flick a toggle switch and the tune is switched to "go faster" and the air shifter system gets activated. I can't wait to get it on the drag strip this spring. Finally was able to get the door of the shed open (frost lifts the concrete slab) and get the ST1300 out. Trying out a "new" Russell Day Long seat, ordered a new air filter, change the oil/filter for the season. Looking at another ST1300 to do some farkle swaps and a resale. Since I last posted on Feb 15, my 1970 Honda CL350 is now back together again and tonight's test ride went great. Over this winter besides the previously mentioned starter R&R, new regulator, new condenser, and I think most important, it now has a full FACTORY air cleaner system. It came with Uni foam filters (that were sort of coming apart) and last fall it just never ran right and since only the intake rubber held the carbs on, heck, one of the carbs came off on me once. With the factory system the carbs are held on from both sides, much better! On the road happy to say it would tach out in all the lower gears and hold 6 grand on the highway (about 60 mph). A front came through while I celebrated in a local bar about 5 miles from home and now with a good tail wind, the old Honda easily would hold 7 grand on the highway. Afraid it don't have much passing power at high speeds, great town bike, but this light naked bike at 60 or greater is not very enjoyable. Yay! Now on to a new project? Oh, I guess you'd better be saving your bike money for the rally next month! I remember way, way back when I had my Kaw two-smoke triple (350) and my cousin had one like yours. We were riding along together and when we came up behind a couple of 18 wheelers, I down shifted and passed them both... then waited for my cousin to pass them too. And waited... and waited... and waited. After a few minutes I pulled over on the shoulder and let those trucks pass me and there was my cousin, tucked in behind that first truck still. I hollered at him asking why didn't he pass those trucks, and he told me that he had the throttle pinned back all the way now! It was all he could do to just keep up with the truck, while I had tons more top end at my disposal. 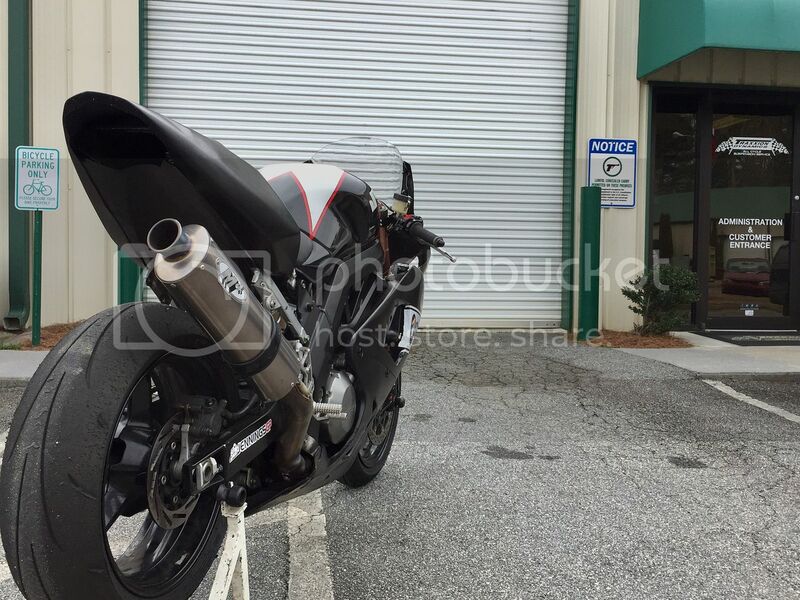 I thought that was amazing... two bikes, both rated at 350cc, yet so different in performance! I might see you for breakfast on the 20th. I don't know if you saw where Bill is wanting to change breakfast to somewhere down in Lincoln. Since it was just me and Bob last month, I'm gonna see if Bob wants to just meet me at Denny's again and to heck with going all the way to Lincoln. If I don't see you at breakfast I'll see you at the rally. The first one to check in gets to stock the fridge with adult beverage! Yup, I would hate to have to pass on the highway with the old 350, I think it will do maybe close to 80 but it take awhile to get there. Sorry, on the road the 20th so see you in MO....I don't believe the room pictures show that a cooling device comes with our rooms-don't see a micro wave either....?? Did a valve adjustment and put new tires on the Honda XR650L. New rear tire mounted on my Versys, second one since mid December. 9000 miles since then. Yes, I like this bike. 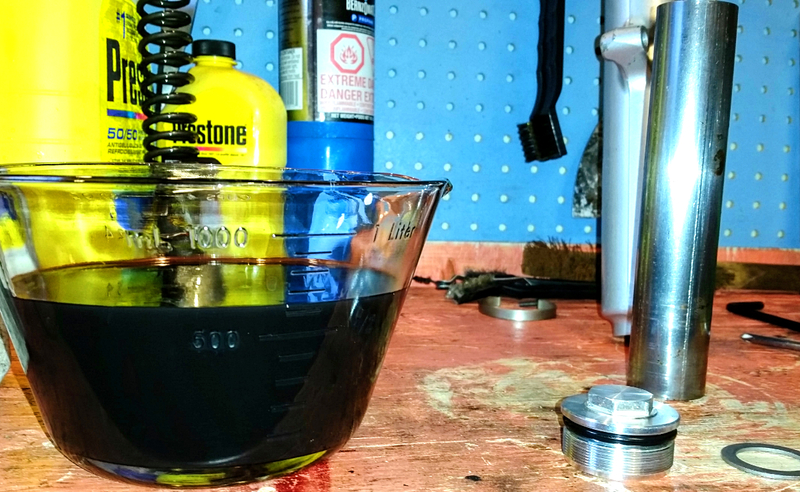 Also changed the oil and drew a sample to send off to Blackstone Labs. Taking off next week for Mn, BC, AB, and the Pac northwet for three months. Estimate 5-6000 miles on this trip. I'll have an extra set of tires with as these may not make the trip. Replaced tube in front tire. Factory tube in a new tire installed 500 miles ago. Small scar must have nicked it on the tire install. Put in ridiculously heavy Michelin tube. Same one I have in the rear. Removed Perelli MT21 from rear and reinstalled Heidenau K60 hoping to get another 2000 miles out of it. Changed front sprocket from 14 tooth to 16. Bike is now transformed from Hare Scramble/Motocross mode to Dual Sport mode. Plan on riding it to the National and back. BTW 5400 miles on this bike and this is the fifth time I have change tires. You would think I would get better at it. Actually, as a decades long hunter who took a Jeep Grand Cherokee with full off-road kit on it (and I don't mean big diameter tires to look cool, either), I went through heavy deer country several times a year. Off of highways, on county and federal access roads, and since we were going to hunt mule deer, the closer we got to our base camp location, the denser the deer became. In all those decades, not once did a deer even cross in front of the Jeep. It had a pair of deer whistles on it, the same brand as are on my Tri Glide. So, once you have the experience I do, you can opine on the subject with some relevance. I got tired of putting plastic bags on my very nice electronic brake controller, so I put it inside a waterproof box on the tongue of the trailer. Put a Gore Vent on it so when it gets hot, the box can vent. Been through a couple raging thunderstorms since I installed it, box stays dry inside, which is all I could ask of it. 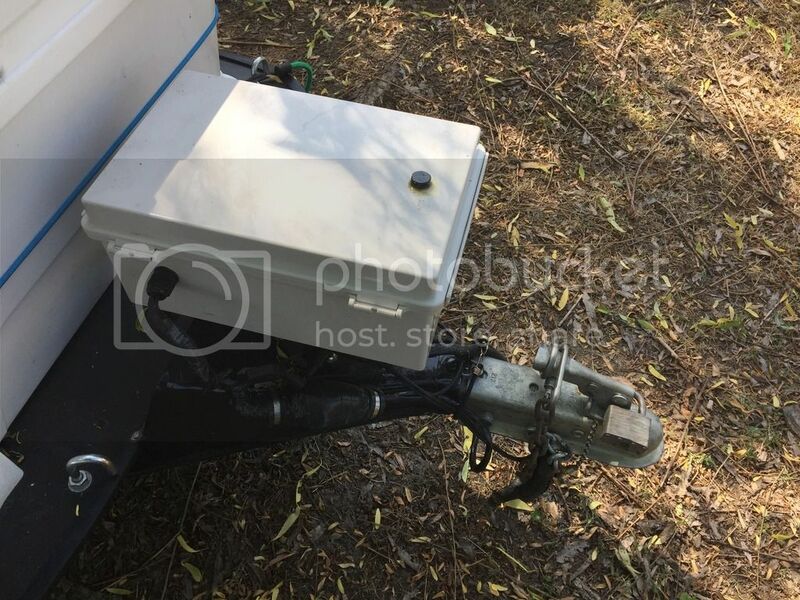 And I don't like the idea of mounting stuff on my trailer am, but that has no weight.. and lloks like you could put "other" important thangs there for quick access.. Everywhere I go, I haul "protection", and have really considered mounting a small, watertight, quick access box (4 digit keypad type) in that very location, for a "just in case" scenario.. not wanting to grab a key, just bink, bink, bink, bink, and grab... drop a speedloader, and step back. Oh, I always have the trunk on, but stupid keys, and the visible part of accessing the trunk, preclude the intent, and give away your "ace in the hole"... I like the little box thing. Of course a glock in the tankbag works, but I'm funny about crossing state lines and such.. dooing that. In the greater scheme of things, it is so light that it doesn't change tongue weight really. The key is on my fob, so its easy to open. I've got a little lock on it just to keep curious people honest, not to protect something truly valuable. Your mini-safe idea looks to be a cool project! I switched seats (for the second time this spring) again, at least temporily. I had bought a Russel Day Long seat to try out since the stock seat on Honda ST1300's are typically firmer than most (including myself) care for and also to help out the passenger seating comfort. Got a great deal on a previously owned RDL but for normal short trips/joy rides I wasn't in love with it and not finding the visual appeal to my liking. A supposed Spencer mod seat was posted on the ST forum for trade for a stock seat. Seemed a good swap opportunity and for daily use I really like this seat. It has multiple vinyl types designed into it and the Pan European logo embroidered nicely into it. Passenger seat as yet untested, but since they are seperate and interchangeable, we can mix/match as needed. The RDL will be reserved for extended rides. I got a used RDL in leather. I am thinking of doing the same thing. Having a short ride daily abuser and save the RDL for the long distance stuff.